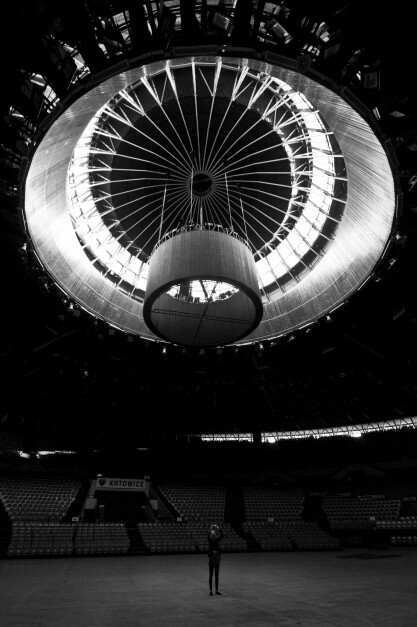 We offer the possibility of staging photographic sessions in the interiors of the Spodek Arena. The iconic hall may serve as a memorable background for wedding, company or artistic photographs. The time for a photographic session must be arranged to fit in with the schedule of events taking place in the Spodek Arena. The cost of a private photographic session is PLN 500 net (up to 4 hours). The cost of a product photographic session is PLN 1,000 (up to 4 hours). It is impossible to have a photograph taken on the Spodek Arena’s roof. Any photographs of the Spodek Arena taken outside with a drone must be reported in line with the provisions of the REGULATION OF THE MINISTER OF TRANSPORT, CONSTRUCTION, AND MARITIME ECONOMY of 26 March 2013 on the exclusion of some provisions of the Aviation Act for certain types of aircraft and to determine the conditions and requirements for the use of such aircraft (as amended), which came into force on 07 September 2016.